When I learned that the theme of this month's Spice Is Right Challenge on Tigers & Strawberries was to cook with flowers, I was excited because I've never cooked with them before. But then the month got away from me for various reasons and all of a sudden I was under the gun and I had to come up with something pretty damned quick. And seeing as how I like to use this challenge to try to stretch my culinary repertoire, I tried to find a recipe that incorporated something new. Which was a major challenge, given my time constraints. 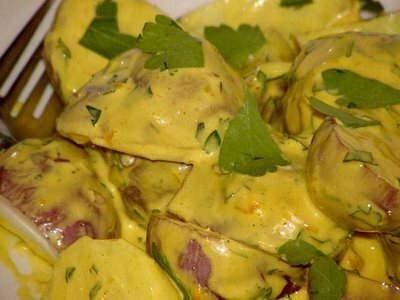 But browsing through recipes that used saffron, I came across this recipe for Baby Red Potatoes with Saffron Mayonnaise. It sounded intriguing, and more to the point fast, but how could I create some adventure out of it? The answer lies in the mayonnaise. I've never made my own. And I've been wanting to for a long time. And ever since I discovered that you could make it pretty easily with a stick blender I've been jonesing to try it. So I got brave and made myself a batch of olive-oil based mayonnaise. That's it on the bottom right. You can't tell from the picture, but it has the most lovely glow-in-the-dark green tinge to it. And the stick blender worked like a charm. In fact, it emulsified so quickly that it startled me. Behind the mayonnaise, in the mortar and pestle, you can just barely see the saffron mixed with crushed garlic. This is right before I put the sauce together to pour over the potatoes. There were a few problems with this recipe. The garlic clove I used was ginormous and really really strong. Although it didn't seem like it at the time, I used too much salt when I crushed it. Those two tastes unfortunately overpowered the saffron a little. The mayonnaise could have used more lime juice. And I should have looked in the bottom of the bowl with the potatoes before I added the mayonnaise because there was some water down there that thinned out the sauce. I absolutely hate it when that happens. But all of these things can be fixed for next time. And there will be a next time. This would make a wonderful side dish with lamb or steak. Whew. Made it just in time! Boil potatoes in water until tender. Drain and set aside. Steep saffron in hot water for 5 minutes. 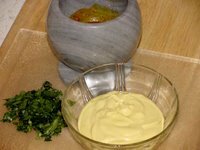 Combine garlic with parsley and mayonnaise, then add the saffron. Add salt and pepper. Add potatoes and mix well. Garnish with parsley sprigs and serve. Potatoes and mayonnaise can be made ahead, stored in the fridge, and combined when desired.